Along the lines of The Lizzie Bennet Diaries and Emma Approved, I just discovered another web series, this one called Classic Alice. Alice, an overachieving college student, just received a "failing" grade on her paper. (Hey, a B- can be devastating!) Her professor criticized it as too analytical and told her she wasn't emotionally connecting to the material. So Alice decides that she is going live through classic literature, selecting different novels to help her spice up her life and prove that she does, indeed, connect with the material emotionally. The first one she picks is Crime and Punishment. Predictably, it doesn't go smoothly. Check out the 14 current episodes here. New episodes are released every Tuesday and I can't wait to see what she selects next. With all the complicated situations, wars, violence, and histories between countries and organizations and individuals in the Middle East, it can be overwhelming to try to sort through. This chart, even though it still simplifies the relationships to three options ("friends", "enemies", or "it's complicated"), was immensely valuable to me. You can click on each cell to get more details regarding the relationships. It's a great starting point for learning more about this important and volatile area of the world. I took piano lessons for several years as a youngster, but I hated practicing. My mother got tired of the fighting, so she let me quit. A little while later I decided playing the piano wasn't so bad and continued to play, accompanying choirs, learning pieces that interested me, and just enjoying the music. Now, with three kids of my own, I'm trying to avoid the fights by letting them work through piano lesson books at their own pace. They'll never be concert pianists, but I firmly believe it's an important life skill for them to learn. This article, "Science Shows How Piano Players' Brains Are Actually Different From Everybody Else's", talks about what learning how to play the piano does to your brain. And it's pretty cool. [P]ianists are able to make their brains into better-rounded machines. But it turns out the heavy-tax of piano playing makes their minds efficient in every way. 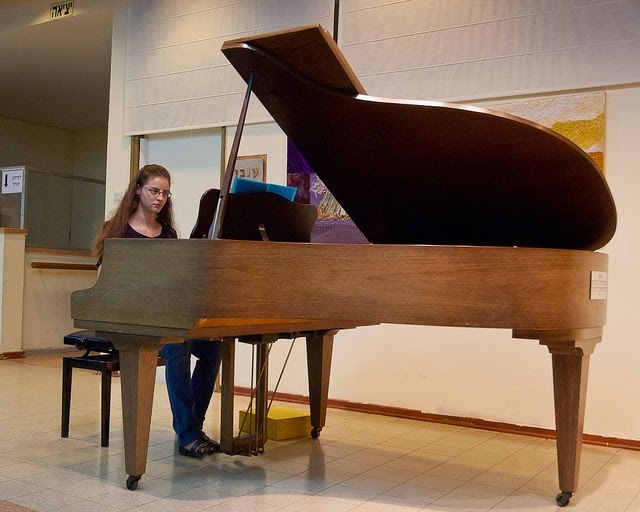 A study by Dr. Ana Pinho (whose name kind of explains her research focus) showed that when jazz pianists play, their brains have an extremely efficient connection between the different parts of the frontal lobe compared to non-musicians. That's a big deal — the frontal lobe is responsible for integrating a ton of information into decision making. It plays a major role in problem solving, language, spontaneity, decision making and social behavior. Pianists, then, tend to integrate all of the brain's information into more efficient decision making processes. Because of this high speed connection, they can breeze through slower, methodical thinking and tap into quicker and more spontaneous creativity. That's worth a little bit of extra effort, don't ya think?